What is an art quilt? Depending on your perspective, the answer is either easy or complex. The easy answer is that a quilt is two or more layers of fabric, and possibly batting, held together with stitching. 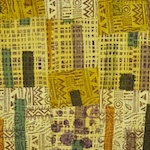 An art quilt is a quilt that serves an artistic purpose rather than a functional one. So, now for the complex definition. What happens when you take a quilt off the bed and hang it on the wall? Is it now an art quilt? Probably not. It's more likely decorative folk art. But again, this is a matter of perspective. What about 3D quilted forms? Can those be called "art quilts"? You can drive yourself crazy trying to pigeonhole art into tiny categories. That's why I'm now more often than not referring to myself as a mixed-media fiber artist. If we must have categories, let's at least keep them broad. The bottom line here is art is art. The categories that I'm using to group the work in my portfolio are based on form. I don't consider them different media.